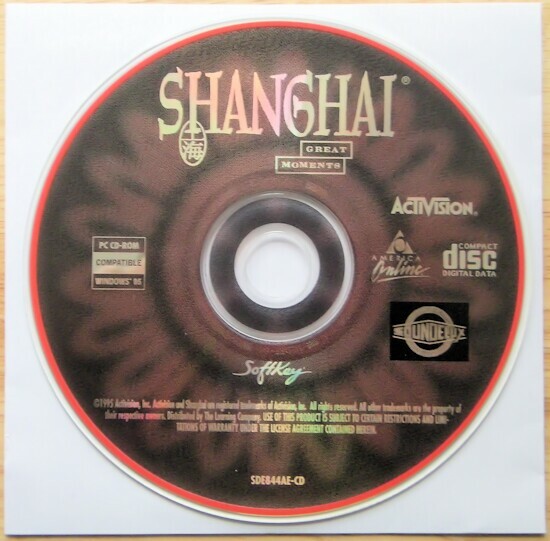 Shanghai: Great Moments was one of the first titles to use the multimedia possibilities of the CD-ROM with video clips, animations and a great soundtrack that really enhance the game. Rosalind Chao from Joy Luck Club will be your host during the game. She will take you on a visual tour of the program, explain the rules of the games, and also provide you with hints and strategies to adopt. If her explanations are not enough, you can always check the online help at any time for further information about the different menus and options. Shanghai: Great Moments features nine different sets based on science-fiction, music, art, space exploration, inventions, people, romance, events and the classic Mah-Jongg. Every time you find a pair of tiles during the game, an animation or a video clip will be displayed over each tile accompanied with sound or music. There are two methods to choose a pair in some sets. You can select two identical tiles or instead, choose two tiles that are coupled. In the Inventions set, for example, you can select an invention and its inventor to make a pair. In other sets, such as the Mah-Jongg, there are special tiles that are unique (seasons and dragons) and to make a pair, you must choose another tile from the same category. When you are unable to find a matching pair on the board, you can try asking Rosinda for help. A small picture of her is located at the bottom right of the screen and if you click on her picture, she will be ready to help you. You can ask her for strategy to find a pair of tiles for you or simply, if you don't know what to do, click on "What Do I do now?". There are other aides included in the game through menus or function keys. You can ask to go back one move, shuffle all the tiles again, find a match, show all possible moves, use the X-Ray and show what tiles are left. The X-Ray mode allows you to see what tiles are hidden in the lower layers, giving you strong indications about what should be your next move. In addition to the Classic Shanghai, you will play with Beijing, Action Shanghai and the Great Wall. With Beijing, besides the normal rules, you can also slide rows or columns of tiles to place matching tiles next to each other and thus, achieve a better score. The Action Shanghai game starts like the Classic mode, but with a limited number of tiles. While playing, new tiles will appear on a regular basis from the bottom of the board moving the tiles upward which will sometimes make other tiles unselectable. The key of success here is the speed! The Great Wall, which is more relaxing, has all the tiles piled up like a brick wall. When removing pairs, the tiles above will fall leaving new free space within the wall. The strategy here is to anticipate where the tiles will fall and make sure that you will still be able to pick up matching pairs. A special option named contemplation will add some difficulty to the game. This option turns all the tiles face down. When clicking on two tiles, they will be shown for a limited time. You must then remember the tiles you saw, discover new ones and find the pairs. This option makes the game really difficult to play, but represents a good challenge for the fans! 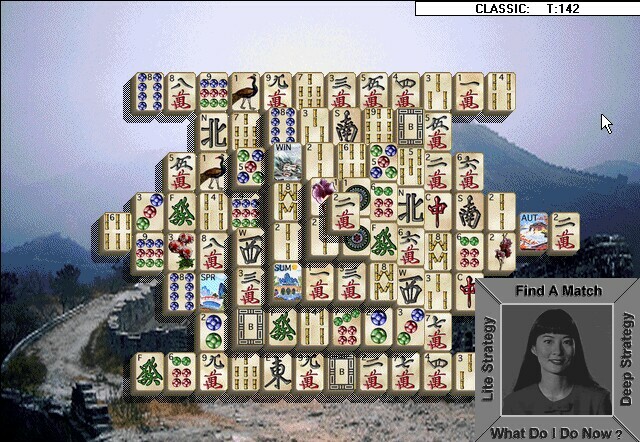 In every game, the board is displayed on various backgrounds showing landscapes of China with the famous Great Wall and cities like Beijing and Shanghai for the classic Shanghai, and other themed pictures for the other tile sets. When you manage to remove all the tiles from the board, you will be rewarded with a video movie related to the tile set you chose.